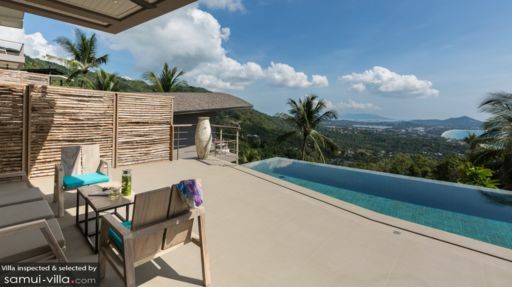 Located in one of the most popular destinations in Samui, Chaweng beach, Villa Lipe is part of the luxurious Comoon Samui Boutique Villas. 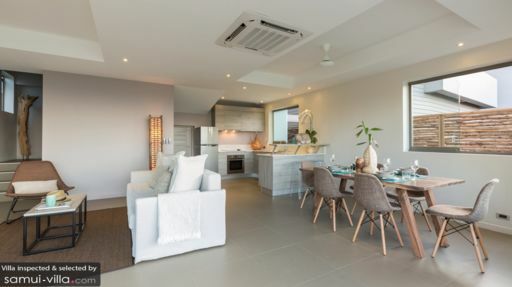 With stunning ocean views ahead, the villa is a contemporary holiday home with amenities like an infinity swimming pool, five-star facilities, private chef on request, and in-house spa services. The villa offers two bedrooms to guests, each with stunning views owing to floor-to-ceiling glass windows. The area itself allows you to explore the best attractions of Samui without any trouble! The two bedrooms at Villa Lipe are found on the upper floor, each attached to a private balcony with a chair or daybed overlooking the sparkling ocean and lush greenery. Enjoy a private sunset for two, right from your bedrooms. The master bedroom is furnished with a king-sized bed while the other bedroom has two single beds. The floor-to-ceiling glass doors allow for an excellent view and there are office spaces and walk-in wardrobes in both rooms. The bedding is luxurious with natural fibre sheets and comfortable mattresses. Each bedroom has an en-suite bathroom with top-end amenities and shower areas. Villa Lipe is home to a splendid infinity-edge swimming pool which is nestled amidst magnificent tropical vegetation. With views spanning the ocean and mountains in the distance, guests can enjoy a wonderful rest on the beanbag loungers found on the pool deck. For utmost relaxation, there is even an outdoor seating right beside the pool, where you can relish chilled cocktails, read a book, while you breathe in the fresh air and bask under the tropical sun. The tranquil surroundings are enough to put you in a good mood, what with the tropical breeze engulfing you completely. Through sliding glass doors, on heads into the dining area and kitchen at Villa Lipe, which not only enhances your front-row view of the stunning vista, but also proves to be an excellent spot for breakfast. With a mesmerizing backdrop, the continental breakfast will be all the more tasty and exceptional. The four-seater dining table is perfect for guests with comfortable chairs and at an easy distance from the kitchen. The interiors are shades of white, aquamarine, and light-grey woodwork. With ample natural lighting, the living and dining is even more beautiful and cheerful. It is an air-conditioned room, so you can enjoy a cooler temperature if the weather is too hot for you. The kitchen is open-plan and fully-equipped. As the sliding glass doors lead to the deck, you can easily grab some snacks and head out for a swim! There are ample amenities and services available for your use. The living room is part of this space as well, with a plush, white couch and chair, facing a Smart HD TV for movie-viewing. Owing to the luxurious vibe at Villa Lipe, there are five-star amenities on offer to guests ensuring they get to experience the most relaxing and rejuvenating holiday of their life. The villa manager and concierge ensure that all your needs are met. If you wish, a private chef, in-house massage, and other services can be arranged upon request. Comoon extends the services of its fitness centre to all guests as well. 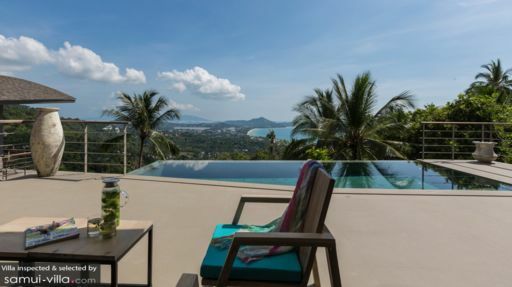 An ideal location, minutes away from Chaweng beach, Villa Lipe is perfect for travellers who wish to know more and explore more of Samui. Head to Sail Rock or Koh Tao to explore marine life with underwater diving. Sail, jet ski, or enjoy a buggy ride to truly understand the natural atmosphere of Koh Samui with its verdant vegetation. Night markets for local finds or Fisherman’s Village for a lesson in history are few of the places you must visit!